Edward Six was born in Baden, Germany in 1835. By 1861, he was married to Anna Schuh and living in Chicago where he operated a saloon at 248 N. Clark Street (now 813 N. Clark Street). The Sixes had four daughters. Mr. Six tried his hand at barbering in the mid-1860s, but by 1867 he was once again a saloonkeeper. His business and residence remained on the 200 block of North Clark through the 1880s. In 1883, Edward Six served as a Trustee of the North Side Saloonkeepers Association. He died in 1890 and was buried at Graceland Cemetery in Chicago. His widow Anna lived with her daughter Mary and son-in-law at 631 N. Sedgwick Street (now 1929 N. Sedgwick Street). She later moved to St. Paul, Minnesota, where she died in 1928. She is buried there in Roselawn Cemetery. For further details, contact the Chicago Genealogical Society. 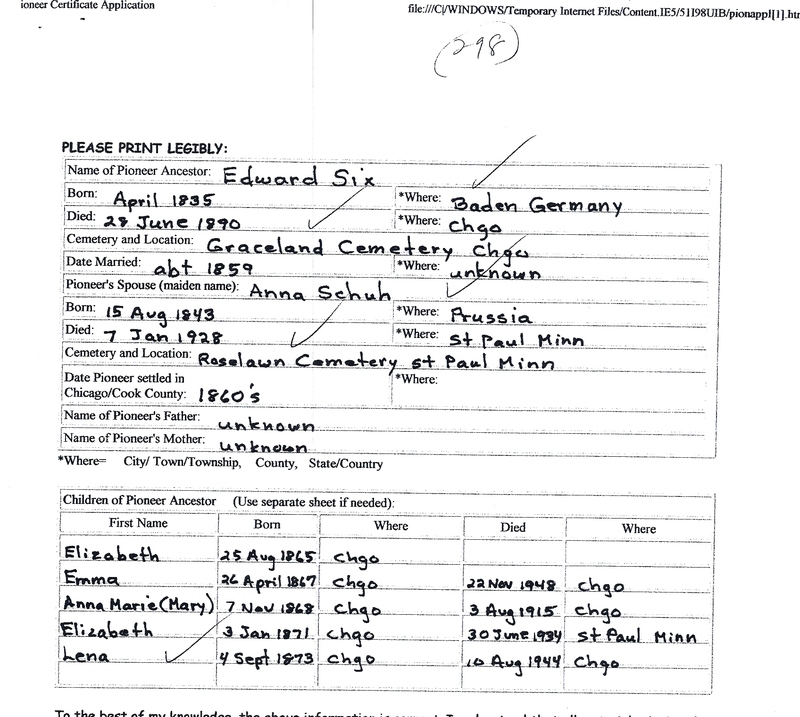 Edward Six is Pioneer Ancestor number 298.